For all your language translation (written word) and interpreting (spoken word) needs, call Interpreting Enterprises, the experts in the industry. As a client-centered business, Interpreting Enterprises meets your individual needs. We bridge language barriers by providing services for an unlimited range of professional fields. Why is Interpreting Enterprises better than the competition? We offer over 15,000 experienced, multiple-language translators and interpreters, many of whom are accredited and certified by the American Translators Association (ATA), State and Federal Courts, and Federal and State government agencies. We also provide expert services and language consulting services. Our firm also provides language training courses. We offer to all of our clients a full-service language support team. Our services are offered in over 150 languages and dialects. Click here to see our full list of supported languages and dialects. 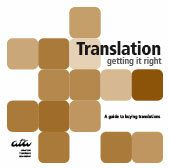 For consumers in need of document translation services, please read "Translation - Getting It Right." To obtain consumer information assistance just click on the link to the right to download. For a scope of all our services, please select the options from the menu tab above. We offer full-service, qualified language professionals in over 150 languages and dialects. The following are a few of our many satisfied clients.